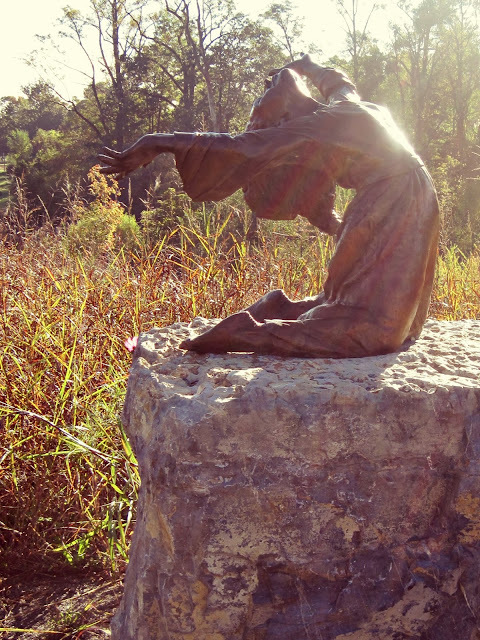 Below is a statue that I love, which is on the back part of the greenway, on a loop I run from time to time. Sometimes, running makes me feel just like this statue. I backed off some on the running this month. More than I had planned to. It's been hard - time constraints, shorter days, an illness, and a hard time finding continued motivation for the treadmill early in the mornings on days I don't have time to run outside. Still, I ran 108 miles this month. I also did weights a couple of times. Readers, what has you lifting your arms up in joy lately? I have not seen that statue and haven't been over the new part of the greenway yet. I used to walk it when taking photos to paint from as it is a real pretty area, much of it is very unlike what people think of a city. stunning statue and I like the rainbow striations, beautiful photo. Running outside is far more pleasurable than the treadmill, & 108 miles bravo. That is a great statue! Good luck with your continued running goals. This is one of my favorite sculptures, though in my mind's eye, I remember it slightly differently. Love that statue. Where is it? Any month free of injury is a good month! That is one of the most inspiring statues ever! I don't know if I've run 108 miles over my entire life, so I'm very impressed with your running stats. Congrats on the mileage! I think it's great, especially considering how busy you are. That's a beautiful statue--such a wonderful expression of joy. So impressed that during a cutback month you still managed over a hundred miles! That is impressive!! Even though you cut back a bit you still logged a lot of miles! I really need to get into an exercise program! That statue is so pretty. Last night I went back to walking. I know it's not running but it's doing something. I used to walk 4 miles a day and bike two. Notice the used to. I might have walked a mile last night. It's just hard to find the time. Last night I was able to because I had supper all ready and when I popped it in the oven I took off. I worry about you running out by yourself. I know I said that before, but still. Beautiful statue -- inspiring really. I don't add up my miles (I guess because it's too small an amount), but I'm happy I was able to run every day in October except for one due to torrential rain. I was having the hardest time keeping up with my runs, but I'm going to try harder! WOW your mileage puts me to shame!! I have many, many things to be thankful and joyful for!!! Just one of them is your blog. I love this joyful woman with the sun on her, she looks wide open to anything. Oh my fur and whiskers. I know you are taking care of yourself . . . I just KNOW you are . . . This art work is amazing. Lifting my arms . . well, yes, as a matter of fact. One of my teachers saw an article I'd written and took it upon himself to add a "proper introduction," adding all my credentials to my name . . . golly, it was kinda . . amazing. I'm surprised to find it feels good . . I know he did that because he cares about me . . . It will go to print that way . . color me blessed. You know? YOU ARE IMPRESSIVE. love & love to you. What an amazing statue! I am so excited about my new job. Run 108 miles in this month... Wow... I have no idea about that. That statue is awesome!! You certainly aren't the slacker when it comes to exercise. That statue would inspire me, too. And holy miles, girlfriend! Way to hit it even in the dark. That is a cool statue - very freeing. Great mileage for last month! Such an amazing statue, and your exercise certainly is a source of motivation for others to begin, Lisa. Take care.